Baader's newest addition for Achromat owners. The Semi-APO works like it's name implies - delivering an amazingly neutral view, while cutting most of the annoying and contrast-robbing violet fringe that plagues all achromats. 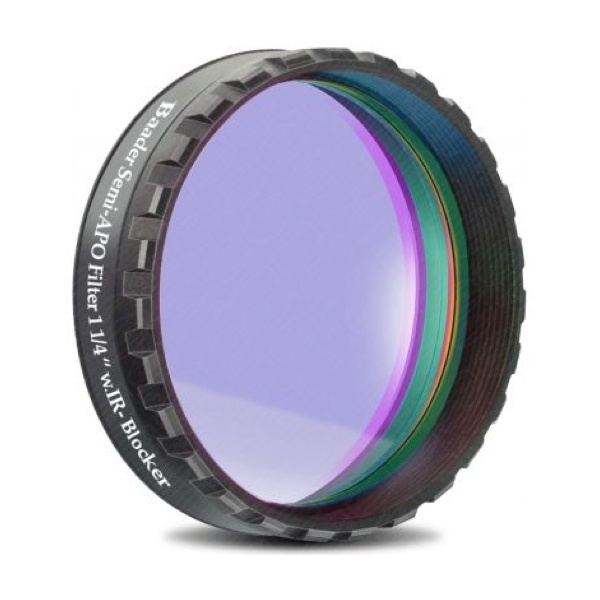 The Semi-APO filter combines a stronger Fringe Killer coating formula with the Moon&Skyglow Neodymium substrate. The result is similar performance to the Fringe Killer + Moon&Skyglow combination, but with a slightly stronger violet cut - and at an even greater ££ value. The Semi-APO filter benefits from all the host of world-class Baader filter attributes. The Semi-APO filter is truly the world's most advanced 'minus-violet' type filter in every regard. It's high efficiency and neutral coloration make it practically disappear in use - while making most of the violet fringe disappear! The effects on sharpness, contrast, and aesthetics are remarkable, even with small refractors. The RGB enhancement of the Neodymium substrate actually boosts colour contrasts, particularly for Jupiter and Mars. As a side benefit, the Semi-APO filter has also proven to be the best Mars filter we've used - with ALL Telescopes, including large Dobsonians, SCTs, and Apochromats. The unique properties that result from the combination of the Fringe Killer's blue wavelength attenuation (attenuation - not total elimination), plus the selective Neodymium RGB passbands, result in a significant contrast enhancement of Martian features. The image retains its natural coloration and brightness, and the optically polished surfaces maintain every bit of the image sharpness, unlike other manufacturer's filters. The high quality of Baader Planetarium filters permits their use well ahead of the focal plane with no image degradation (ie, for cameras or binoviewers). The inclusion of Baader's renowned UV/IR Cut coatings on the Semi-APO eliminate UV and IR wavelengths to make it ideal for high-resolution imaging with Webcams, DSLR, and CCD cameras (see the UV/IR Cut filter below, for more detail on these coatings). The high transmission and fringe reduction work great for both planetary and deep sky imaging.